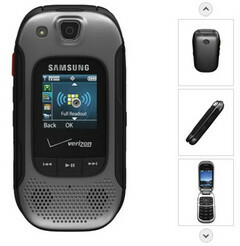 Earlier today, Verizon added the Samsung Convoy 3 to its lineup. This rugged phone can withstand shocks, dust, humidity, solar radiation and extreme temperatures. Verizon Wireless made the Samsung Convoy 3 available for purchase via its website earlier today, advertising it as able to handle "outdoor hobbies, harsh job sites, and everyday life". The Convoy 3 is a flip phone that comes with support for Push to Talk voice messaging and its ruggedized design has been certified to meet the MIL-STD-810F military standard. The Convoy 3 comes loaded with applications such as Opera Mini, Backup Assistant or Media Center and is capable of connecting to Facebook and Twitter. The handset also features GPS and meets the MIL-STD-810F military standard for protection against the following hazards: shock, dust and sand, vibration, humidity, low pressure, high and low temperature, temperature shock, salt fog, and solar radiation. Having a full retail price of $199.99, the Samsung Convoy 3 can be purchased online for $99.99 after a $50 mail-in rebate and with a two-year contract.